Petit Hotel d’Hafa in Sayulita is a vibrant cultural experience that can’t be missed. Located on Calle Jose-Mariscal just steps from the plaza and town center, this little gem is a quintessential respite for the travelling poet, loving honeymooners, new retiree couple, or anyone who wants to enjoy a chicly styled Mexico vacation only minutes to the beach and seconds to all the excitement and nightlife of the village while wrapped in comfort and style. When you arrive, you will be inspired by the soothing bedrooms, extreme attention to detail, and décor that relaxes you upon entry. This original, downtown Sayulita hotel building has been completely refurbished to give you an authentic experience of the highest quality Sayulita has to offer while being in the heart of this vibrant village. Upon checkin, you are invited to explore the rooftop terrace, have a complimentary shot of our house tequila while lounging in comfort overlooking the vibrant village of Sayulita. The rooftop terrace will likely be one of your favorite places to hang out, read a good book, catch some sun, or lounge in the shade. An open-air stairway spirals up the center of the lobby leading to the rooms, providing a cozy and secure feel when you return each night. The rooms then have balconies to the street and the open-air lobby, allowing for light breezes to pull through the rooms. Each room is uniquely decorated with art and handicrafts carefully selected from different cultural areas of Mexico. Mattresses and linens are of the highest quality, thus ensuring a perfect night’s sleep. Each room contains hand-tempered copper sinks and large, artistic showers. And of course, the rooms are equipped with fans and some even have mini-fridges to keep your drinks cool. The location in the center of Sayulita offers convenience, and fun, but we recommend light sleepers bring earplugs, as Mexico can be an exuberant country and you are in the heart of it. Petit Hotel d'Hafa offers the perfect accommodation for one, two, or three fun loving people who want to enjoy some of the best that Sayulita has to offer, being in the center of all the action without spending a small fortune. Be aware this is a hotel in the heart of the action and in the center of a vibrant town with nightlife. Please use the contact form to get in touch with any questions and to request a reservation. Come let us give you the perfect Sayulita hotel vacation. Looking forward to seeing you soon! We enjoyed our stay at hotel d'Hafa. It has a great location, friendly staff, very clean and safe. The rooftop (and complimentary tequila) were such a beautiful bonus. There is absolutely nothing negative we could say about the Hafa and would 100% stay here again. The perfect place to stay to enjoy everything including the nightlife! 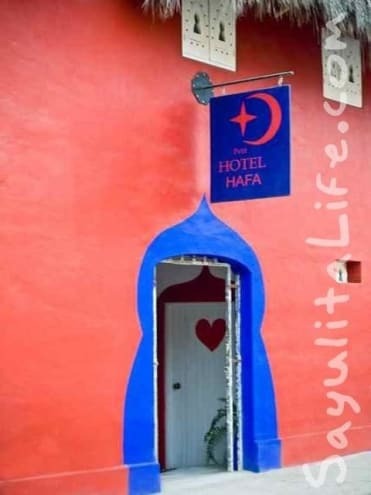 My friend and I have stayed in hotels all over the world, and the Hotel Hafa is by far one of the most lovely we've ever been to. The central location couldn't have been more convenient, and the rooms were always clean and inviting to return to after a day at the beach. The staff were all very friendly and helpful. I can't imagine staying any place else in Sayulita. Sweet Hotel! Right near all the fun! My brother and I recently stayed in room #1 at Petit Hotel d'Hafa in Sayulita and we had an awesomel time. Very cool artistic decor, clean, spacious rooms with great aesthetic, super groovy bathroom and cool A/C. The rooftop common area with chill out lounges, beautiful flowers, great views (and complementary tequila shots!) was a favorite. Can't beat the central location, the hotel bar down the block is one of the coolest in town, and the staff was remarkably helpful and kind. If you like to go out and have fun this is the perfect hotel for you, so close to everything and you never have to worry about having too far to get home at night. Most adorable hotel I've ever stayed in! Love this magical, enchanting hotel! Petit Hotel Hafa has so much soul and energy. It truly is a magical little retreat in the heart of Sayulita. I loved the interior, so beautifully designed and decorated. The rooftop if stunning, and a great little spot to relax. The rooms are super clean and the staff are lovely. You really feel like you are staying in a home- I absolutely loved it and will definitely be back! Perfect place to experience your stay in Sayulita. We had an amazing stay! The room was ideal and the rooftop was its own little private sanctuary. Rooms were cleaned every day to brand new! Right in the heart of Sayulita, yet we didn't feel It was loud, but we like music. Great food within seconds of walking outside the hotel. The beach is a simple 3-4 minute walk. Christophe was an outstanding host when we needed advise or recommendations for the town and also surrounding areas. We look forward to coming back and timing the swell so we can go surfing! Petit Hotel Hafa is a great little place in the heart of Sayulita. The price is very reasonable, the rooms are clean and the staff is friendly. Walking distance to everything. The hotel could use some updating. But overall the experience was very good. One thing to keep in mind is that being located in the center of town there is some loud music from some bars. Not super late hours, though. Will definitely be back. In love with Sayulita and this hotel! Petit hotel d'Hafa was simply perfect. It's super clean, safe, beautifully artistic, the rooftop is amazing, the rooms are perfect, the staff (especially Gabrielle) is really friendly and always there to help you if you have any questions and it can't be more well located (few minutes away from the beach, near the plaza and many restaurants and boutique). My friend and I had a wonderful time at Hotel Petit Hafa. We would 100% recommend you this place. Plus, we would 200% recommend you Sayulita. It's a lovely place, with a surfer vibe and it's perfect if you're looking for a place to relax, explore many beaches, surf, meet new people, drink margaritas (and 2$ coronas), eat too many tacos, and just enjoy the sun and the chill vibe. As with the center of any town there is music at night but it did not bother us. From the moment I arrived at Hotel d'Hafa I fell in love with the simple but chic aesthetic. Every detail from the painted walkway, to the pillows and the cactuses on the terrace were carefully chosen and perfectly coordinated. In addition to the decor, my experience itself could not have been more wonderful. I stayed for the better part of a month and Gabrielle, Effy and Christophe went out of their way to be friendly and incredibly accommodating. I frequently extended my stay, changed my plans and at all times they made me feel at home and were beyond helpful and welcoming. I stayed in numerous rooms and in each of them the beds were extremely comfortable with excellent air conditioning and hot water. Shampoo and soap is provided. The hotel's location is in Sayulita's epicenter. I loved being so close to yoga, the beach and all of my favorite places to eat. Hafa bar is also a great place to grab a drink downstairs. And the rooftop is beautiful and a truly lovely place to sit and relax. My time in Sayulita has been magical and the stay at Hafa has been a big part of that. I expected a more quiet and completely restful place. I understand this is not the fault of the hotel. The hotel is well located in the center of the city,and there was a party outside every night the mattress was in poor condition. The beds were two put together twins instead of a king size. For your security we accept PayPal and transfers to our bank here in Mexico. Come an enjoy Sayulita staying with us. Christophe, Marina and family welcome you.